Jody has written novels for the last 18 years (with a hiatus when her children were young). After many years of writing and honing her skills, she finally garnered national attention with her double final in the Genesis Contest, a fiction-writing contest for unpublished writers through ACFW (American Christian Fiction Writers). Her first published book, The Preacher’s Bride (2010 Bethany House Publishers), hit the CBA Best Seller list on two different occasions and has won multiple awards. 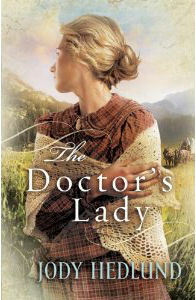 Her second book, The Doctor’s Lady, released this September. She has completed a third book which will be released in 2012. She’s currently busy researching and writing another book! Left scrambling for options, the two realize the other might be the answer to their needs. Priscilla and Eli agree to a partnership, a marriage in name only that will allow them to follow God's leading into the mission field. But as they journey west, this decision will be tested by the hardships of the trip and by the unexpected turnings of their hearts. If you would like to read the first chapter of The Doctor's Lady, go HERE.